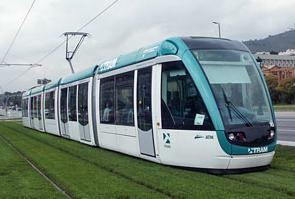 Tramway is the newest mean of transport in Barcelona. Established in two different Tram lines, it manages to unite Barcelona with Northern and Southern border towns: Cornellà, Sant Joan Despí, Hospitalet and Esplugues (Trambaix) and Badalona and Sant Adrià del Besòs (Trambesòs). The tramway is a means of transport that was commonly used during the beginning of last century and has been recently re-introduced in Barcelona. This mean of transport allows passengers traveling in a relaxing way on the surface in urban areas and avoiding queues and traffic jams. Trambaix is the Tramway located at the southside of the city and connects the city with the towns of Hospitalet del Llobregat, Esplugues del Llobregat, Sant Joan Despí and Cornellà. Trambesos is the Tramway located at the northside of the city and connects the city with the towns of Sant Adrià del Besós and Badalona. Tickets are the same as those used in the metro, bus, FGC and RENFE and transfers among all these means of transport are allowed within the following 1 hour and 15 minutes from the first validation of the ticket. This feature is applicable to all tickets except the single trip. Tickets can be bought at every Tram station as they include ATM (Automated Teller Machine) although note that these machines only accept payments by credit card or coins.